What Day Of The Week Is July 9? 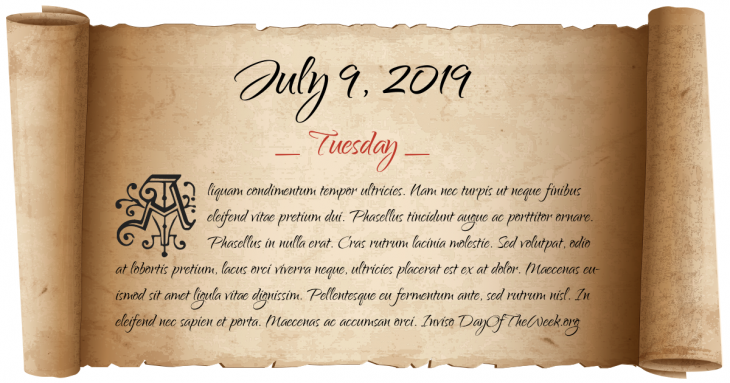 July 9, 2019 is the 190th day of the year 2019 in the Gregorian calendar. There are 175 days remaining until the end of the year. The day of the week is Tuesday. Nineteen Catholics suffer martyrdom for their beliefs in the Dutch town of Gorkum. The Treaties of Tilsit are signed by Napoleon I of France and Alexander I of Russia. U.S. President Zachary Taylor dies and Millard Fillmore becomes the 13th President of the United States. World War II: Operation Husky – Allied forces perform an amphibious invasion of Sicily. World War II: Battle of Normandy – British and Canadian forces capture Caen, France. Lituya Bay is hit by a mega-tsunami. The wave is recorded at 524 meters high, the largest in recorded history. Who were born on July 9?